Randy has hitch itch. He is itchin’ to hitch up and get moving again! We haven’t stayed two consecutive months anywhere (since we left Boise over a year ago) before doing so at Farragut State Park. 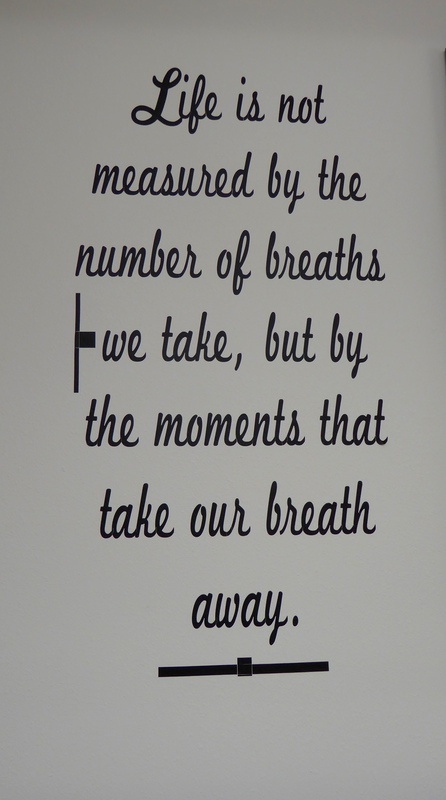 We arrived on July 1st and have just a few days left before moving to Montana on August 31st. 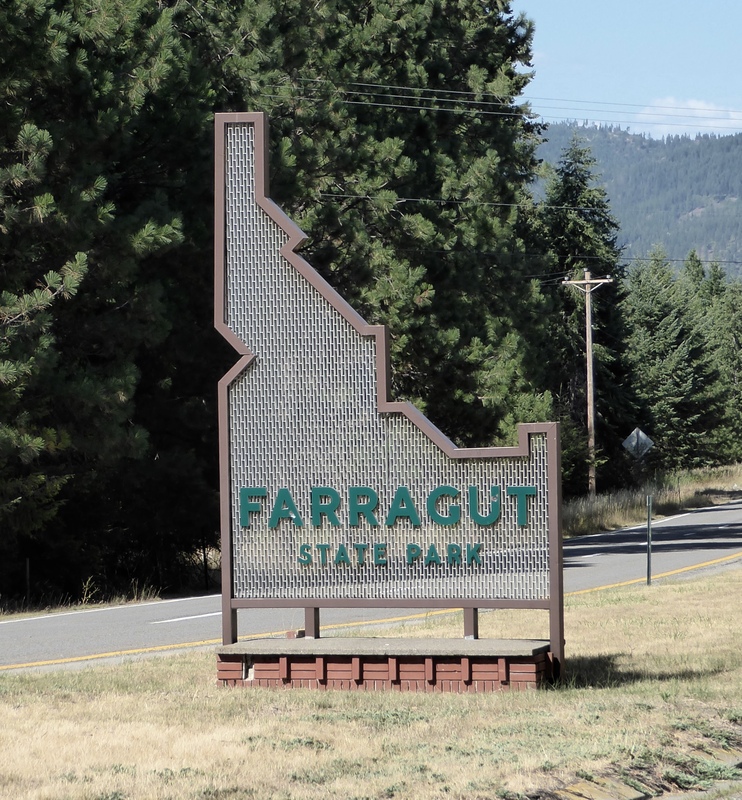 We really like Farragut State Park and hope to come back and volunteer again someday. There are so many walking/biking trails to wander and we enjoy the naval history aspect. We’ve had plenty of excitement with family and friends visiting, two fires, and most recently a broken water main which took out our restroom and shower complex for a few days. 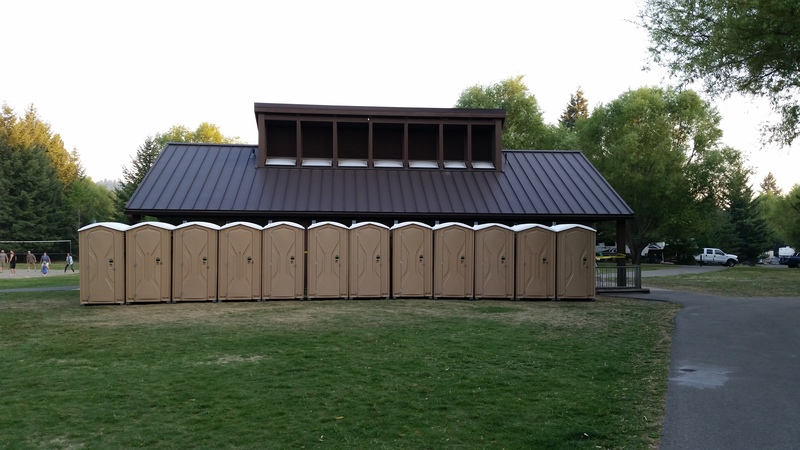 Twelve porta-potties for our guests. 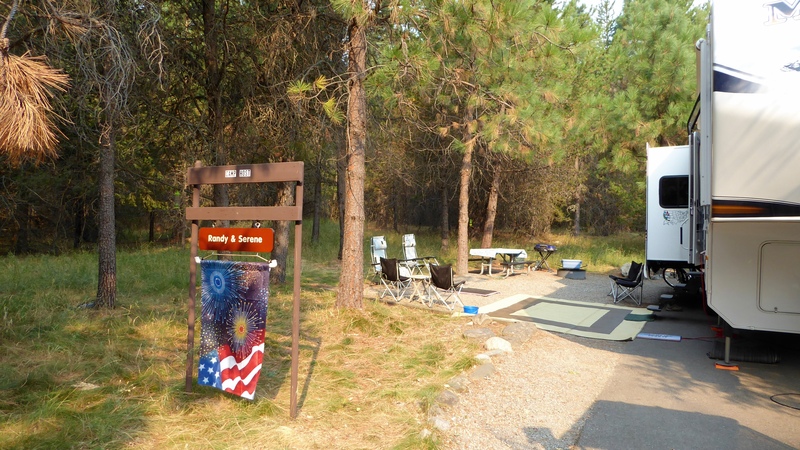 We’ve had a great campsite that was private enough that Elko was rarely on his chain, something he appreciated greatly! And we’ve had wonderful partners! Bob and Aloha are from Fresno and have been camp hosts here for five years. Many afternoons and evenings have been spent chatting at their site or ours. Someday when Boise State plays Fresno State, we are going to end up on Bob and Aloha’s doorstep! 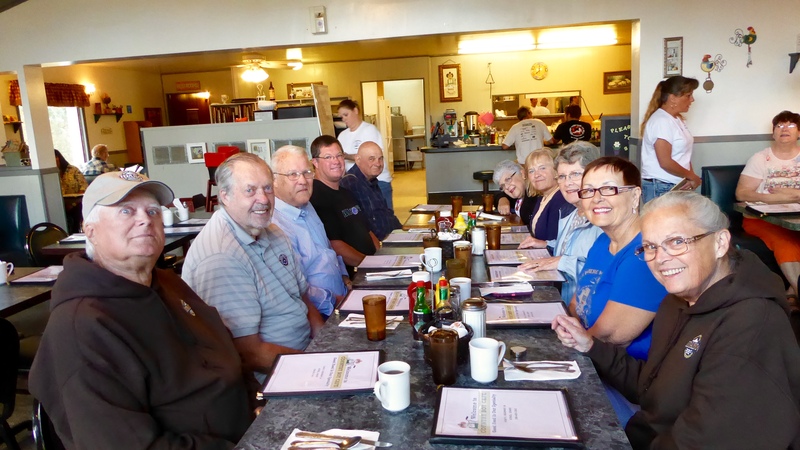 We’ve enjoyed Sunday morning breakfasts at a local cafe before coming back to clean sites. Sundays are typically the largest turnover day. This past Sunday we cleaned 50 of the 68 sites! It doesn’t really seem like that much work when you do it with good friends. Recently, on our days off, we have explored a couple local museums. 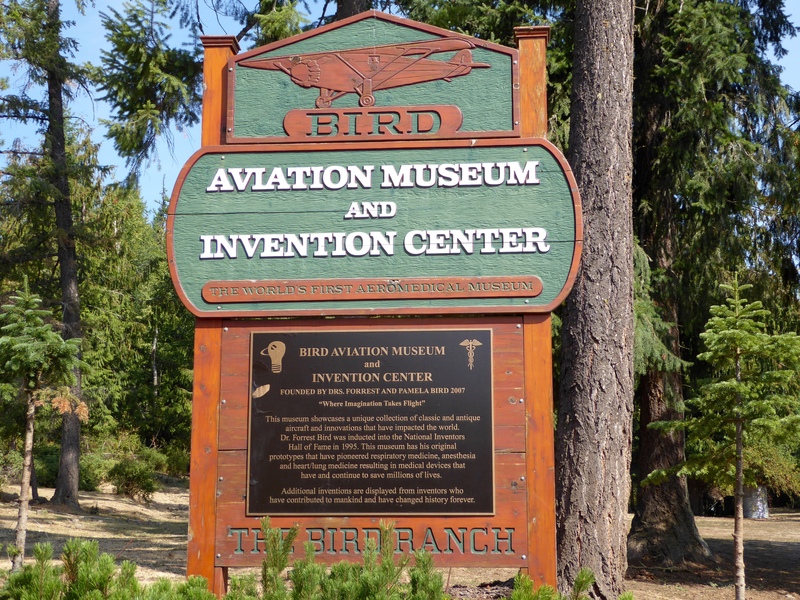 Near Sagle, Idaho, actually out in the middle of nowhere, we visited the highly recommended Bird Aviation Museum and Invention Center. It was well worth the hour drive. 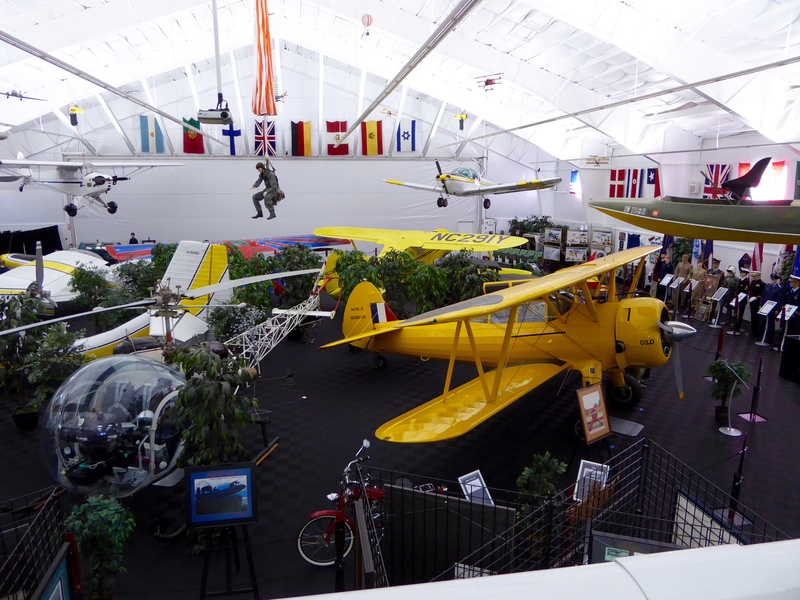 The Museum has information and exhibits about aviation, war, inventors and inventions. We learned about the WASPS, the Women Airforce Service Pilots, consisting of 1102 female civilian pilots who flew missions (bomber, cargo, drone, training and transport) of over 60,000,000 miles during World War II under the command of the US Air Force. Did you know? We didn’t! Forrest Bird was the son of a World War I fighter pilot whose contemporaries were the Wright Brothers and Amelia Earhart. He grew up in that world and began flying at age 14. Forrest Bird was a pilot during World War II. The allies knew that German pilots could fly at higher altitudes so had to have a type of respirator system. We were told that he examined a downed German plane to learn about their respirators. 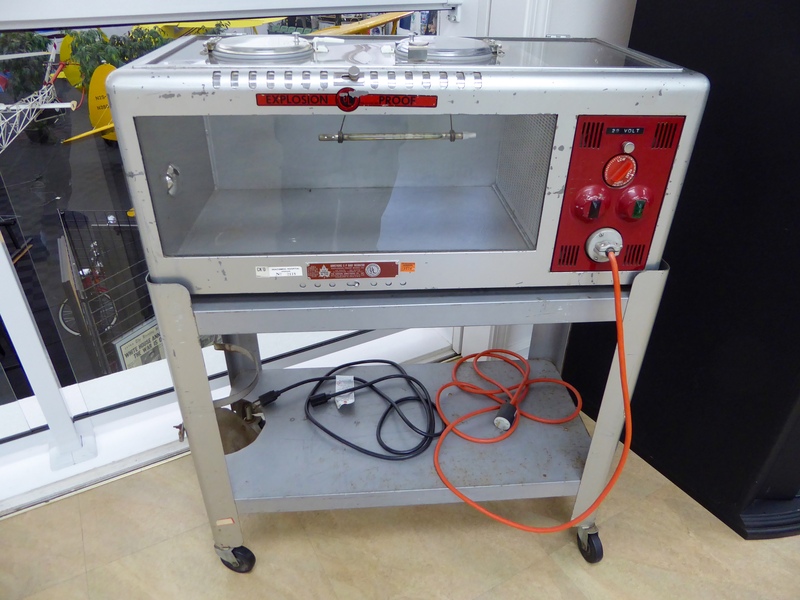 A family friend and Forrest Bird’s first wife both suffered from emphysema and he developed a rudimentary respirator which helped each of them. Respirator development continued and became his life’s work. 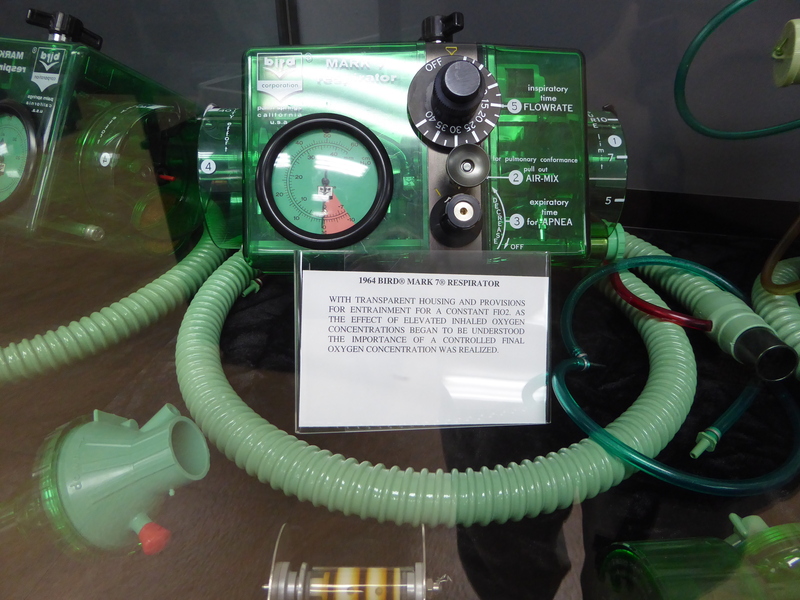 The Bird Mark 7 (the 7th prototype) became the first mass produced respirator in the world, is commonplace in hospitals, and is still in production (with improvements) over 50 years later. Developed in 1969, the Baby Bird respirator decreased the death rate in premature infants with respiratory distress from 70% to less than 10% within two years. It also eliminated blindness as a result of too much oxygen. Further development of respirator systems and aircraft modifications allowed for the birth of Intensive Air Transport beginning in the VietNam era. Forrest Bird is credited with saving countless lives through his varied respirators and medical transport work. 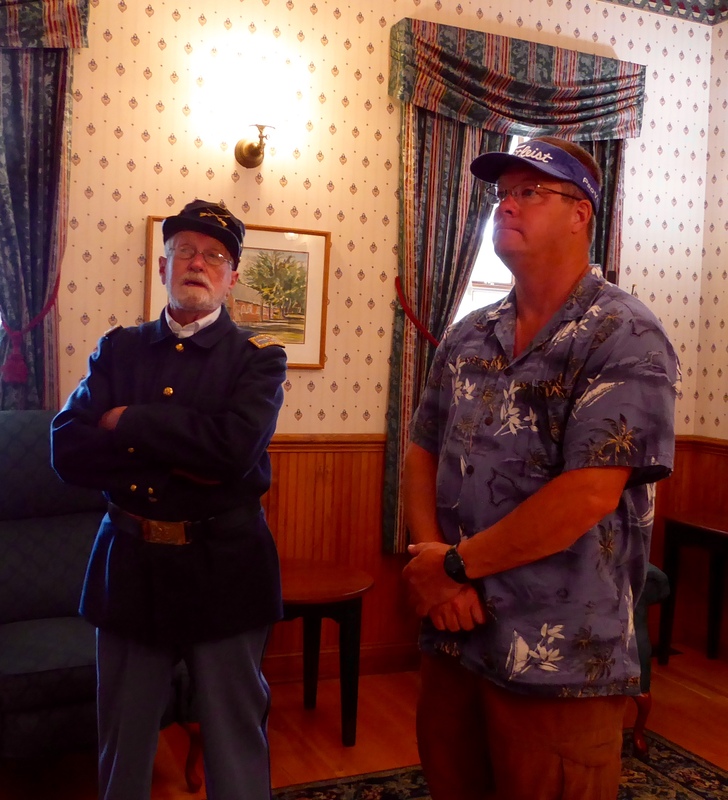 We also visited the Museum of North Idaho and enjoyed a Living History Walk with Robert Singletary representing General William Carlin, Commander of Fort Sherman. As Randy and I were the only ones on the walk that morning, our one hour tour became a two hour walk and conversation which we enjoyed very much. Mr. Singletary has taught at various universities and been chairman of the museum board. 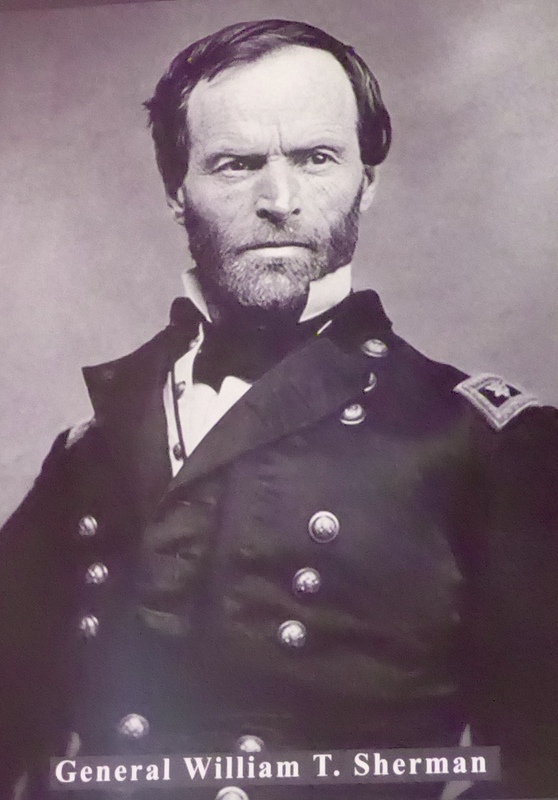 After all I’ve heard about General Sherman, I was surprised he was such a nice looking man! General William Tecumseh Sherman conducted an inspection of military needs in the west in 1877. He selected a site on the lake for a fort which would provide a military presence given the Indian Wars. The fort, built a year later was named Camp Coeur d’Alene. General Sherman returned to inspect the fort in 1883. 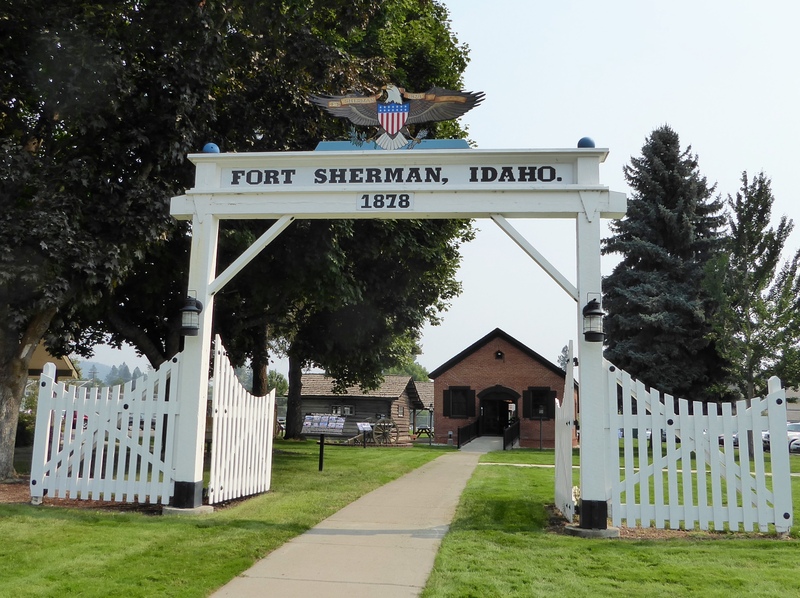 When he retired, the camp was renamed Fort Sherman. 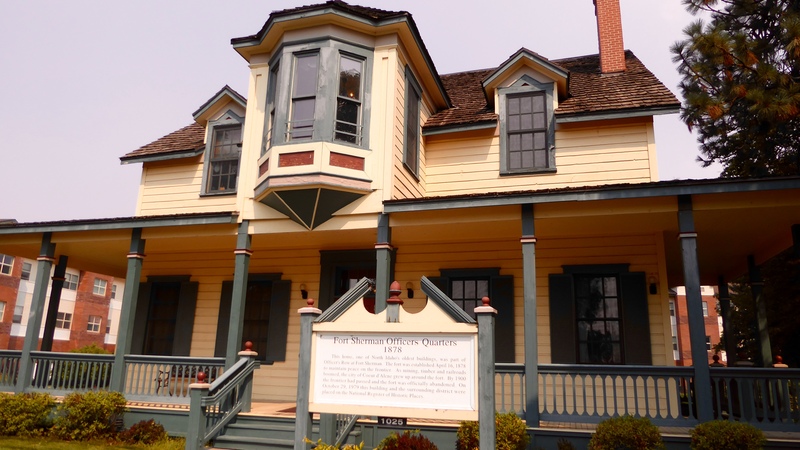 The adjoining community then adopted the name of Coeur d’Alene. A 3/4 replica of the Fort Sherman entrance with the Powder House behind. Three buildings remain from the original fort and sit within the North Idaho College grounds. The Powder House has been remodeled into a small museum. 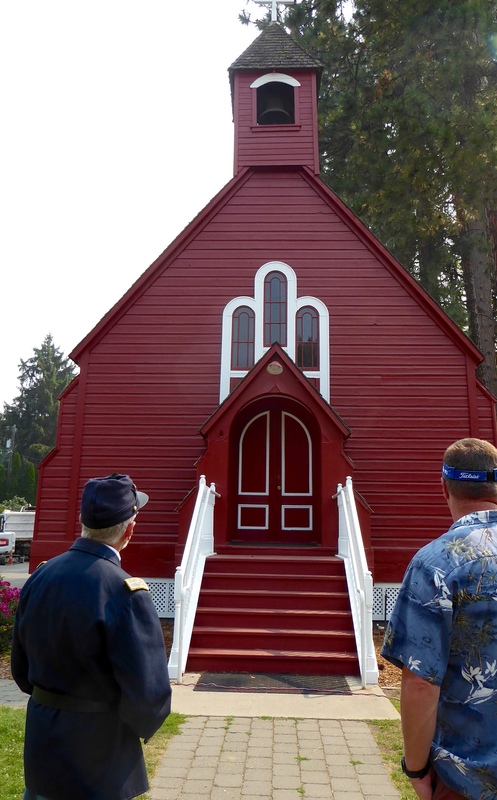 The chapel is available for events and meetings and the Officer’s Quarters have been remodeled into faculty offices. 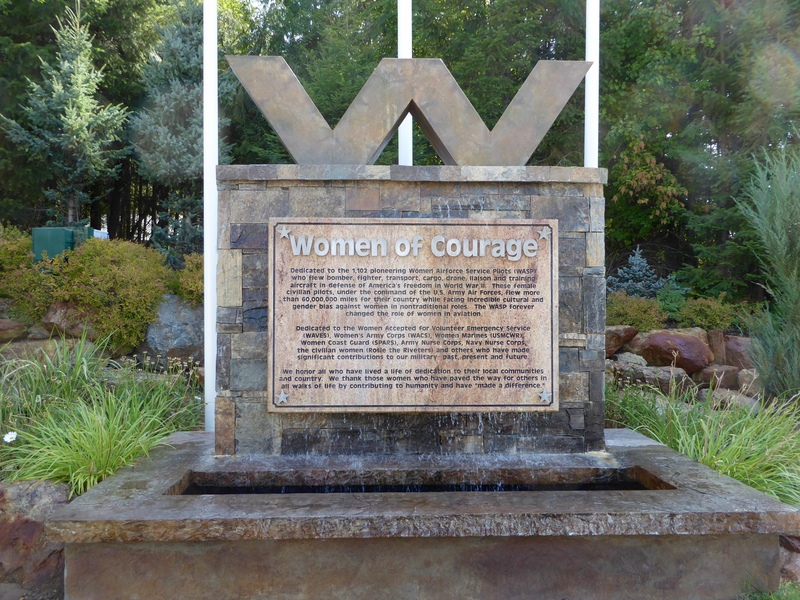 The native peoples in the area, the Coeur d’Alene tribe, called themselves the Schitsu’umsh, meaning “Those who were found here”. Like many native peoples, they originally roamed a large land encompassing 5 million acres. Unlike many native peoples, their reservation lands are within their original lands. At some point, the federal government decided that each adult should receive a deed to 160 acres. When lands were distributed by deed, the remaining parcels within the reservation were sold to others and the reservation lands were reduced as a result. Currently, with proceeds from their casino, the Coeur d’Alene tribe is buying back those parcels within their original reservation as they become available. We will learn more about native peoples, The Crow, at our next volunteer gig in Montana. 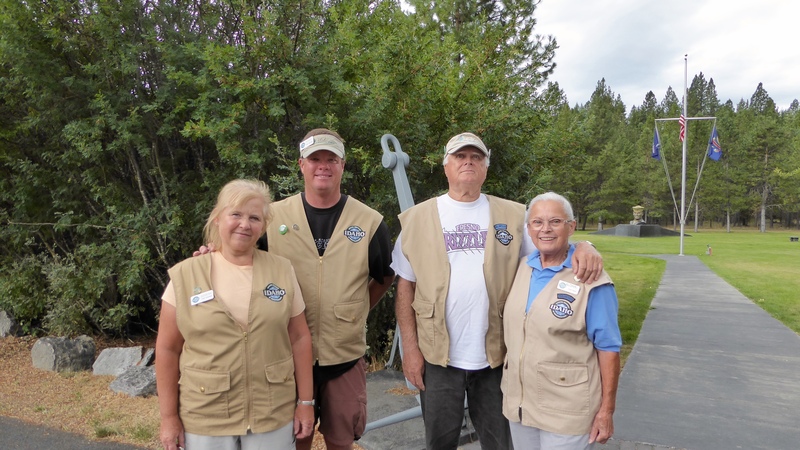 We will be helping at Chief Plenty Coups State Park (south of Billings) for the month of September. Randy will be helping with maintenance and I will be working in the visitor center. The adventure continues! Wow, 2nd grade! I have a few pangs at school starting without me this year – that I didn’t have last year. Strange! But we really are happy wandering around out here so all is well. Glad to have you aboard!